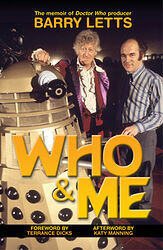 Note: The first print version of Barry Letts's memoir, telling the story of his time as producer of Doctor Who in the early 70s. Was originally released as a downloadable e-book in 2007, and a year later was released as an abridged audio reading. Foreword by Terrance Dicks and afterword by Katy Manning. Barry Letts began his screen career as an actor, starring in the Ealing film Scott of the Antarctic and TV dramas such as The Avengers, The Moonstone and Gunpowder Guy in which future Doctor Who actor Patrick Troughton took the lead role. In the 1960s he switched to directing, taking the helm of classic shows such as The Newcomers and Z Cars. Barry got his first taste of Doctor Who in 1967 when he directed the six-part serial The Enemy of the World. In 1969, he took over as the show's producer. This was an exciting time for Doctor Who — the show had a new lead actor, and was being broadcast in colour for the first time. Barry reveals his memories of this era, talking about his relationship with script editor Terrance Dicks and the show's cast, Jon Pertwee, Katy Manning and Roger Delgado. Packed with behind-the-scenes gossip, fascinating production detail and wry humour, Who and Me recounts Barry Letts' journey from struggling actor to successful producer, and the ups and downs of working on Doctor Who during the Jon Pertwee years. Note: Limited to 200 individually signed copies — though due to Letts's untimely death shortly before publication, he did not autograph any of these copies. Instead they were signed by Terrance Dicks and Katy Manning (who contributed the foreword and afterword respectively).